And so the Olympics have come and gone like a whirlwind, bringing joy and happiness to the world and 'inspiring a generation'. From start to finish, it was one incredible spectacle that captivated everyone who witnessed the drama and theatre that was played out in front of packed crowds at every venue across London. 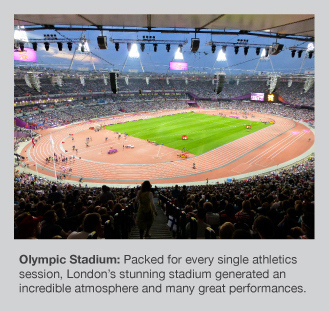 When the time came for the athletics programme to begin, expectation reached fever pitch as the planet's finest athletes came together to perform against the magnificent backdrop of the 80,000-capacity Olympic Stadium. There was so much to enjoy - not least the incredible evening on Saturday 4 August when Team GB secured three precious golds in the space of an hour to top the athletics medal table for several days to come. Usain Bolt duly became the star of the Games, as he proved once again that he's the undisputed king of speed after victories in the 100m and 200m, coupled with a sensational final leg that helped to give Jamaica a new 4x100m World Record mark. From a British perspective, Mo Farah has elevated himself to the all-time greats with his long distance double. Having been lucky enough to be in the stadium when he lined up against his 5000m rivals, I honestly thought he would struggle to repeat his 10,000m success from the previous Saturday. How wrong I could be. Urged on by the unrelenting, vociferous crowd, Mo was roared on to a famous and unforgettable victory that sent a chill down the spine as he surged across the line to write his name into Olympic history. There were cries of 'We want Mo' ringing around the stadium as his ceremony was placed last to guarantee a true hero's reception as he collected his second gold of a fantastic Games for the 29-year-old. The atmosphere was like nothing I have ever experienced - it was simply electric. I can also say that I was a little hasty in my dislike of the Team GB kit... I have to admit that I've warmed to it and would even go as far to say that it was one of the most distinctive and attractive kits at the Games. Great job designers after all! In terms of personal highlights, Seeing Felix Sanchex return to glory after many years in the athletics wilderness was a truly great sight that ensured he will be remembered as a legend in the 400m Hurdles after winning gold eight years after his first triumph in the event. Other favourite moments included Robert Harting getting the better of his Discus rivals then embarking on a 100m Hurdles dash to celebrate (fortunately all mascots were safe this time, unlike in Berlin at the Worlds in 2009...! ), Aries Merritt continuing his exceptional season with yet another sub-13 clocking in the 110m Hurdles, Allyson Felix winning her first individual Olympic gold and Greg Rutherford finally fulfilling his potential on the world stage in the Long Jump. Without doubt, London put on a wonderful show and the athletics shone brightly with a total of four World Records (including the 20k Walk) and a glut of World-leading performances to boot. Rio now has a lot to live up to as the benchmark has been raised further but I'm sure Brazil will deliver a fabulous Games that boasts loads of energy, excitement and charisma.